Designed for working with 10 Gigabit Cat6A shielded cables, as well as Cat6E, Cat7, and oversized Cat5e/6 industrial Ethernet cables for data, audio, and video applications, the 10Gig Termination Kit from Platinum Tools is a manufacturer's kit that includes a Tele-TitanXg Cat6A/10Gig Crimp Tool, 100 x RJ45 Cat6A/10Gig Shielded Connectors, a Cyclops 2 Cable Jacket Stripper, and a CT-360 External Ground Crimp Tool. 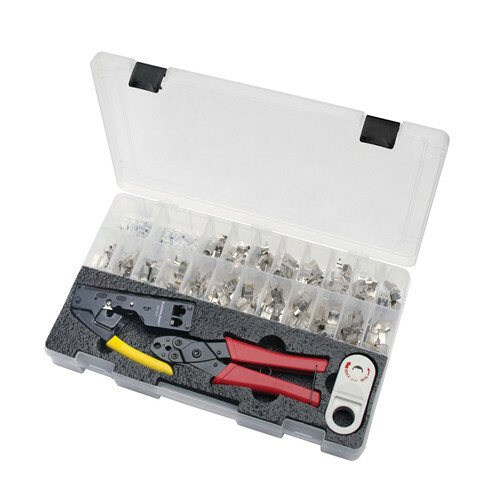 The Tele-TitanXg is specifically made for terminating Cat6A/10Gig connectors, the CT-360 External Ground Crimp Tool will perform 360° crimps on the external ground tab of shielded RJ45 connectors, the Cyclops 2 Cable Jacket Stripper automatically adjusts to help cut PVC, plenum, and others without damaging the braids, foils, or conductors, and the RJ45 Cat6A/10Gig Shielded Connectors are headers that attach to the cable ends, allowing the RJ45 cables to interface with a LAN outlet. Box Dimensions (LxWxH) 14.016 x 7.953 x 1.969"